New Day Packaging Products carries an array of bubble, foam, and cushioning material that’s manufactured by reputable brands and capable of supporting multiple industries. We can offer packaging solutions for delicate electronics such as computer towers, circuit boards, monitors, and keyboards. With our suspension packaging, products are suspended between layers of highly resilient film that prevents slippage and protects against impact, shock, or vibration. Our retention packaging uses a proprietary frame and film membrane combination that works great for handheld electronics, digital cameras, and laptops. 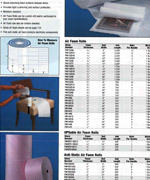 We carry a unique line of paint can foam shipper kits that are pre-assembled with inserts, can lids, and locking rings to prevent spillage. 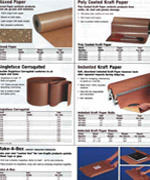 These kraft corrugated kits are UN/USA D.O.T approved and highly recommended by most major freight carriers. For securing multiple boxes or loads into a uniform shape, our stretch film and shrink wrap products will meet any warehousing need. We offer cast machine or blown machine stretch film, micron stretch film, anti-static stretch film, and an array of compatible dispensers. 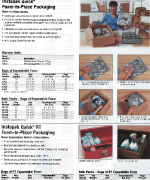 These products work great for bundling boxes or other unique shapes together for transport. Available in multiple gauges and sizes, our films feature exceptional cling performance that keeps items secure. For shock absorbing and cushioning applications, our air foam rolls protect delicate products using thousands of built-in air cells to shield glass, kitchenware, furniture, and consumer items. 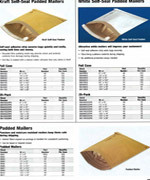 Light weight and moisture resistant, these are sold with perforated, rolled, or dispenser-ready options.